Are you searching for opportunity in your life? Do you need God to open doors for you? Do you need Him to protect you from going through doors that would hurt you? Open to me the gates of righteousness; I will go through them, and I will praise the Lord” (Psalm 118:19). This verse hit me so hard because I had been praying for open doors in this ministry … and here is the psalmist doing the same thing! Out of struggle, no less! See, Psalm 118 is a victory psalm. However, it’s not your standard victory song–the kind sung in the midst of victory. Nevertheless, despite the fact that the psalmist was going through a lot–I repeat, A LOT–when they wrote this song, they are still praising God. They’re praising Him for His goodness, His mercy, and His help–all of which the writer had experienced, despite their hardship. This psalmist wasn’t praying for righteousness (right standing with God) itself. He was already in right standing with God. He was praying for GATES of righteousness to be opened. What does that mean? What are the gates of righteousness? “Righteousness” simply means “right standing with God.” So, I believe that “gates of righteousness” are open doors of opportunity that keep you in God’s perfect will. God has a perfect will and a permissive will, you know. He always knows what’s best for you and for me–and He always wants to give us His best. Sometimes, however, we get ahead of Him. We get headstrong or even confused. If we get ahead of God–or if we want something in our flesh soooo bad that we let our desire for IT get ahead of our desire for HIM–then sometimes we walk in His permissive will. He lets us do things or have things, but they aren’t the best. You could marry that person, but you know in your heart he/she is not God’s best for you. You could buy that car, but you know perfectly well that you don’t have the cash and can’t really afford the payment. You could watch TV all morning, but you know God would prefer that you spend time with Him right now instead. When I think of walking in God’s permissive will, it makes me sad. Times have I made choices that God let me make, but they weren’t His best. Times when Papa given me something because I begged for it … but, all the while, it grieved His heart. Times have I gotten out of His timing, just because I didn’t take the time to discern His season. Probably way more than I know … and I don’t want to do that anymore. 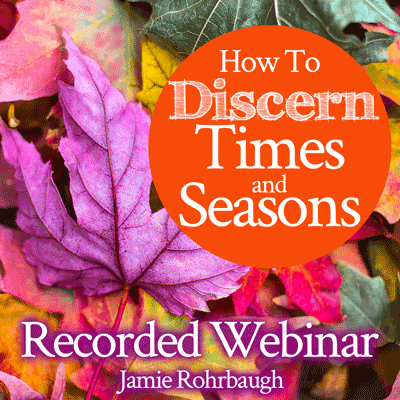 Related: My “How to Discern Times and Seasons” video class will help you learn to recognize what God is doing, when He’s doing it, and what His timing in your life is. Click the image to grab it on my Gumroad store! Don’t you want Papa’s highest and best for you at all times? Oh beloved. He knows the plans that He has for you. Yes, we can have hopes and dreams and desires. We were created to dream with our Father God; to dream with Him and for Him and in Him! Jesus even said that we should want things–and should ask for the things we want! Are we willing to go to the cross if what we’re asking for is not Papa’s best for us? And, are we willing to let Papa open no doors at all if the door available to us at this time is not His best? If what’s available to us now is not His most perfect, most beautiful, highest will for us? I’m really bad about this. I admit it. We’re a microwave generation, but we serve a crock-pot God. But you know what? Sometimes waiting is better for us than making the wrong decision. It irks my flesh to say this, but it’s the truth nonetheless. I don’t want to walk in God’s permissive will. I want to walk in His perfect will. And in order to do that, I have to wait on Him. Even when the waiting feels long. Even when the waiting feels like it’s too long. Even when the waiting feels painful. Even when I “feel” forgotten, discouraged, or marginalized. It’s still better to wait than to miss out on God’s best. I only want God’s best; don’t you? I think the psalmist in Psalm 118 wanted God’s best too. He had been in a struggle. He’d experienced God’s correction. He’d experienced persecution. He stayed in faith, believing in God’s victory … but he still desired for God’s doors to be opened to him! It’s so moving to me that this psalmist didn’t specify which exact gates he wanted open. Oh, I’m sure he did in other times and other places, regarding other topics. But on this day, in this song, his craving was simply for God to open the doors that would keep the psalmist in right standing Him. Oh Lord. Can I be so trusting? Will You help me? Beloved, do you need the gates of righteousness opened to you too? Do you need Papa to open doors for His perfect will to be carried out in your life? Do you need Him to lead you and guide you, opening doors that only He can open and closing doors that only He can close? He will, if we pray. When I noticed this Scripture a few weeks ago, I prayed into it immediately. I prayed the same thing the psalmist prayed: “Lord, open to me the gates of righteousness!” I could feel the rightness of this prayer. I could feel the power in it. And you know what? A few minutes later, Papa answered it. I had been praying for open doors for this ministry. And just a few minutes after I prayed, the Lord opened a door for us to partner with a local church’s jail ministry, to sow into prisoners and help provide resources that can transform their lives. I was stoked about that … and not a little surprised by how quickly it happened after I prayed. Thank You, Lord! I have been continuing to pray this prayer, and I know Papa is answering it … even when it’s hard. To be perfectly honest, I think right now He is answering it just as much with closed doors as He is with open ones. I had a big disappointment just last week with a closed door, and that closed door hurt pretty badly. I also saw immediately that Papa was at work, and that He was answering my prayer. It was HARD to trust Him; really hard. I was tempted to get depressed, discouraged, and offended. He’s our glory, and the Lifter of our head. And if we will trust Him, He will open to us those gates of righteousness. He will keep us in His perfect will. We will be safe there; and, eventually, we’ll be glad we waited. “Heavenly Father, Abba, Papa, I come before You in Jesus’ name. Precious Papa, I love You. Thank You for knowing me; for loving me; for having a good plan for me; and for knowing exactly what’s best at any given moment in my life. Thank You for knowing right now what You want me to do; for knowing which doors You want me to walk through; and for knowing which doors You do NOT want me to walk through. Father, I want to honor You in all things. I want to reflect Jesus well, and I desire to obey You perfectly at all times. However, I need Your help. I can’t do it alone. Papa, Your Word says that You will give me wisdom if I ask for it. I need wisdom, Father; so please, fill me with Your wisdom from above. Instruct me and teach me in the way I should go, and guide me with Your eye upon me. Help me to humble myself before You, so I will follow You meekly wherever You lead. 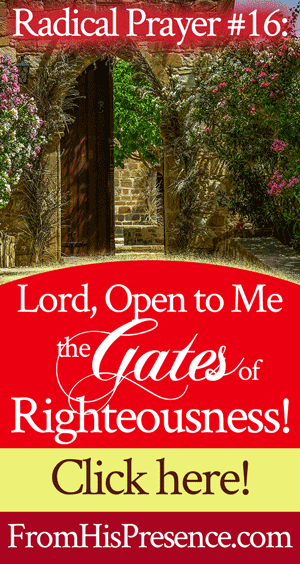 Father, open to me the gates of righteousness. I ask in Jesus’ name that You would open doors for me that You want me to walk through–Your highest and best doors. Give me opportunities that are from You, and help me to obey You and walk through those doors. Make me brave, Father, to follow You even into the unknown. But Father, at the same time, I give You permission to make me wait. I don’t want to walk through doors that aren’t Your best for me, Lord. I want to be patient and persevere in Your highest, most perfect will. I want to stay in Your perfect will, Lord, not Your permissive will. Therefore, Papa, I ask also that You would close doors for me that You need to close. Delay doors that You need to delay. Slam shut doors that You need to slam shut. Not my will, but Your will be done. Father, I acknowledge You as the great Regulator of opportunity. Help me to keep asking and praying aggressively over everything You desire for my life. At the same time, however, please regulate the opportunities that come to me, Lord. Permit only those things to reach me that are truly Your best for me, and give me discernment to know the difference between what You are doing and what my flesh wants. Abba, Papa, I love You. Glorify Your own name in my life. Help me to love You more and be closer to You than ever before, even while I’m waiting. Help me to honor You and obey You in all things, even in the matter of these open doors. Does this prayer from Psalm 118 resonate with you as well? If so, please leave a comment below! I love to hear from you. Blessings to you and your boys???? Thank you for this prayer and this devotional it was a blessing to my life this morning of Monday, June 4 10 AM. Please continue to do what you do and blessing the Saints God bless you! So Awesome Jamie!!! I prayed that pray with tears rolling down my face, with my heart yielded and I only want His best and His Perfect Will!!! I want to make sure that I know the difference and not let my flesh take over. Holy Spirit drown me in your Presence. Holy Spirit sit on me, lay on me, get all through my blood, mind, spirit, soul, bones, everything, so that I will be led by You when the Righteous Doors open!!!!! Amen. Thank you Jaime for this very timely word. You put to words the prayers of my heart that I just couldn’t formulate. God bless! Love this prayer Jaime. I have been applying and interviewing but no fruitful results. This is very encouraging and I will pray this prayer as I wait on our Lord. What do you do when you feel you’ve done something of the flesh and living in God’s permissive will, but want to be in God’s perfect will? Thank you. Thank You Jamie. This word is exactly what I need today. I will be praying this prayer daily. Omigosh, Jamie. I had just been in the courts of Heaven dealing with a matter. And this shows up. Been dancing, declaring “open to me the gates of righteousness!” Yes!!! Praise God!!! !, Glory, Glory be to God!! Thank you for sharing, I needed something like this before my doctors appointment today. I fell and. hurt my knees. And my ankle. And also been sick with the flu for a month now. I pray everything will be okay when I leave the doctors office. This prayer really has calm me down. Thank you, thank you, thank you. Gods blessings for sharing. In Jesus name I pray, Amen. So timely. I was praying this morning about God about not wanting to miss His timing of when to move forward in the next chapter God has for me. Thank you Lord! Thank you for this encouraging word. You know its so true when you know you are suffering in situations because of decisions that you’ve made out of Gods will. I’ve prayed this prayer today and I trust that Daddy God will help me to wait on Him for my open doors. I receive this prayer. “Ithe great Regulator of opportunity”. Thanks so much for this encouraging word and prayer. Thanks for paying and praying the price so others can. Perfect Psalms, perfect prayer, as often times – we try to open our own gates. 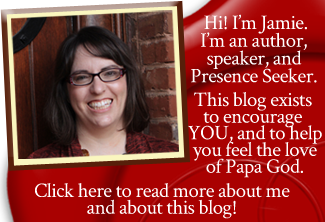 Jamie, you said God was like a crock pot…I’m at work and I laugh and I laughed so hard(forgive me papa) people was probably wondering what was so funny, but that is a good way of putting that and I love this whole post entirely. I thank you for letting God use you to spread the good news of the gospel, I will continue to follow you and will start giving so you can reach many more just like me…God Bless You And Your Family.. Sometimes waiting and trusting in God is a hard thing to do but when and only then we make the decision that God knows what’s best for us even though we want what we want if only we let go and let God give us the desires of His heart I believe that God will open the best and greatest doors for us. And shut the doors that the enemy had lined up for us. Amen! Yes, even as I wait help me to continue to honor and praise you Lord. All glory to you Father God. I feel so blessed to have run across this ministry! I am a Speech Pathologist so I can really appreciate your well written wisdom and the language/vocabulary you use to teach us to pray specifically for God’s perfect will for our lives! I’m in a spot of transition. I want to be used by God to reach others too, and prosper so I can bless others, just like Joyce Meyer has taught as well. He wants us to prosper so we can bless others…. I love giving! I always have….but now I want give more spiritual gifts, like devotionals by Sarah Young, CD’s for worship music and some of the excellent products you are selling. I’m praying for God to lead me into a job where I can use my communication skills to become prosperous to bless others… I don’t need a bigger house, or a newer car. My treasures are in heaven… but I need money to support myself and to give generously to those hurting souls who need to know our Awesome Father to walk through this temporary life and to accept Jesus in their hearts so they too, can look forward to our permanent home! I am definitely going too become a partner with this ministry. Thank you so much for helping us all to grow closer to our PapaGod! That’s my deepest heart’s desire! This is crazy!!! Literally today I was reading Psalm 118, again, not completely knowing the significance of why the Lord had given it to me, three or so years ago, very profoundly, and today reading your blog you explained EVERYTHING I needed to know!!! Praise the LORD!!! I am printing this word off….truly you are SPOT ON Jamie! Love, Love, Love!! You always speak my heart…I am so grateful that I found you!! I am adding it to my list of prayers to pray…breakthrough is here in Jesus Name!! Jamie…… Thanks so much for sharing the words that God has given you,every day it help keep me focus ?????? Amen Amen!!!!!!!!! !